As I was getting ready to end my enlistment in the Navy, I was considering some options with how I would address my housing in my new life as a civilian. I was thinking about purchasing a sailboat to live on instead of taking the usual route of an apartment or house. Kelly, my girlfriend at the time said that living on a boat was just crazy talk and no one in their right mind lives on a boat. So, I pursued my flight training and we eventually got married and settled down in an apartment, then a house. Fast forward ten years and Kelly surprises me with a dinner cruise on a sailboat on the Willamette River through downtown Portland. We enjoyed a wonderful time on the river. The captain of the boat cooked up a fantastic salmon dinner on the grill as we silently floated down the river. The sails were up as we “ghosted” downwind. It was peace incarnate. I could live on a boat like this. So we talked more about it and decided that we were going to make this our goal. We were already planning on having a family, now we would work towards taking our family on the adventure of a lifetime. In that time we have made significant progress towards our goal. We have also made some serious mistakes that have resulted in setbacks. The one thing we have not done is let go of that dream. It has been our constant companion. The dream of exploring the world with our kids on our sailboat has helped bring a clarity to the major decisions that we have faced. We have been to numerous boat shows looking at boats of any vintage. Learning about the details of different designs and the trade offs of those designs. 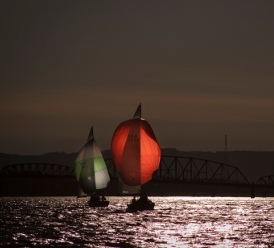 Through a serendipitous connection I have been able to crew on a boat during the weekly racing series here on the Columbia river. We are continuing to make progress towards our goal. As we make steps towards our goal we will let you know. When we make mistakes, I’m sure there will be some, we’ll let you know about those too.